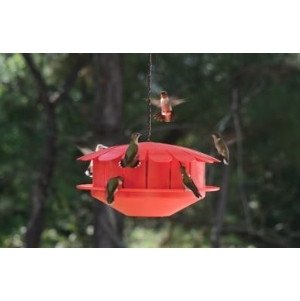 Red Glass Jug Hummingbird Feeder, 23 oz. 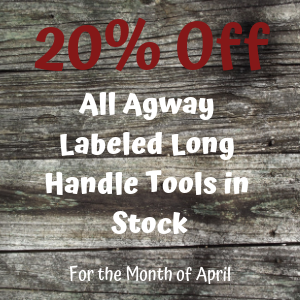 Add a vintage look to your backyard or garden! This uncredibly unique, vintage bottle is an easy fill and it's also easy to clean! Unlike vertical tube feeders, seed will always be available at all feeding ports. 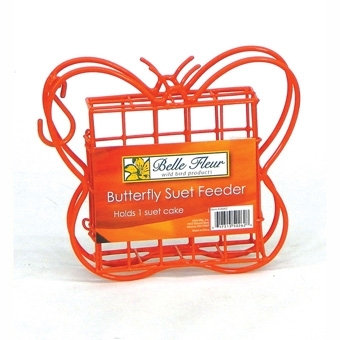 This orange Butterfly Suet Feeder is available for purchase at Talmage Farm Agway! 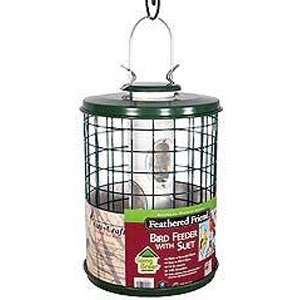 It holds 1 suet cake and will attract clinging birds! Holds 5 pounds seed. 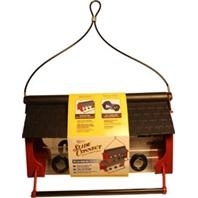 Motor driven, weight activated perch ring flips squirrels off when weight is applied. Holds 5 pounds seed. Collapsible mechanical perch rods that are weight activated for small birds. Deters large birds. Lifetime Warranty. Holds 5 pounds seed. 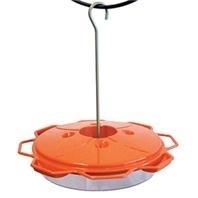 Collapsible mechanical feeding tray, weight activated for a variety of birds. Holds 5 pounds seed. Collapsible mechanical perch rods that are weight activated for small birds. Deters large birds. Allows cardinals to perch. 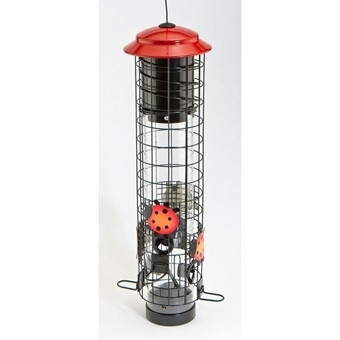 Feeder has 4 nectar feeding stations and 4 jelly feeding stations. Holds 1/2 orange. Metal hanger attached. 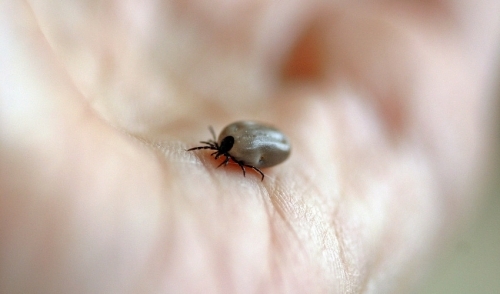 Built-in ant guard. Dishwasher safe. Holds 12-16 ounces. 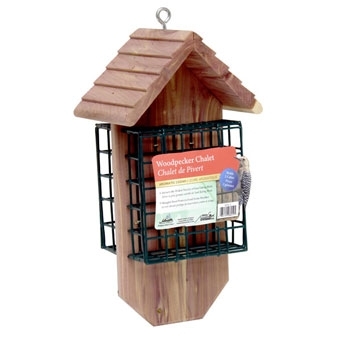 Features 6 feeding ports that allow birds to feed normally, but closes with a squirrels weight on the perch or any part of t. The rustic metalwork adds a classic look of patina. 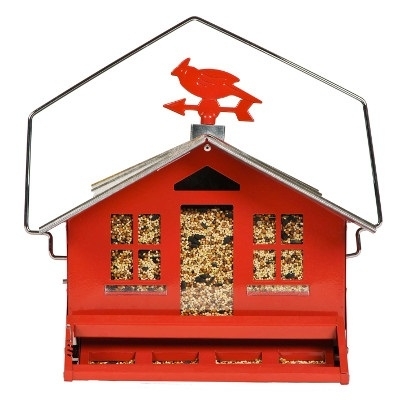 Holds 3.4 pounds of sunflower seed or any seed mix. 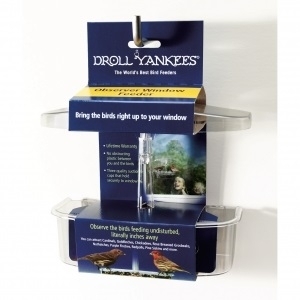 The Observer Window Feeder’ open, clear construction allows for unobstructed and up close views of birds as they feed. 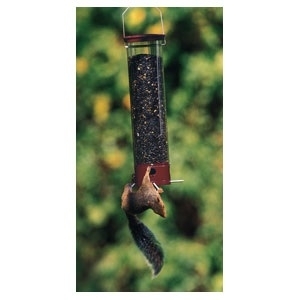 This feeder attaches securely to a window using 3 suction cups. 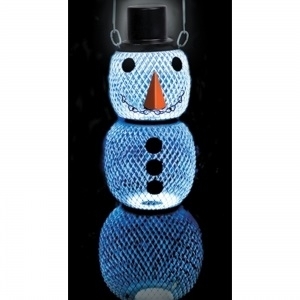 It is constructed of a sturdy polycarbonate plastic that stands up to the elements and won’t yellow with age. 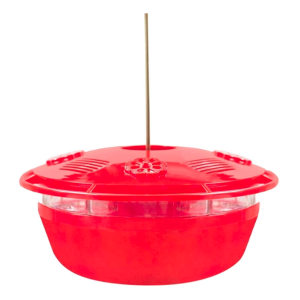 The 7 inch dish is suitable for offering seed, fruit, mealworms, or suet. 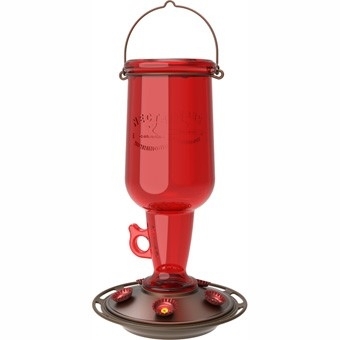 Captures solar energy through sensors in the top hat which power led lights to illuminate the feeder at night. No assembly - just fill, hang and enjoy. 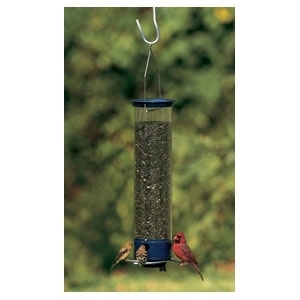 Dispenses black oil sunflower or safflower seed through the all-metal mesh. 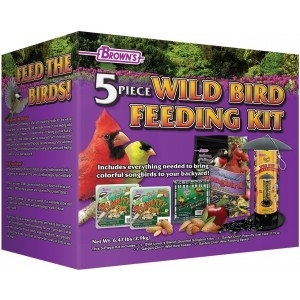 Double sided feeding draws more birds to yard. 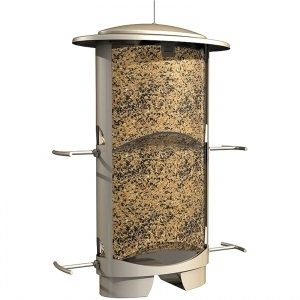 Adjustable weight settings to select the birds you want to feed. 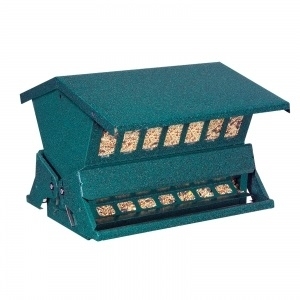 Spring operated perch drops and automatically shuts off access to seed. 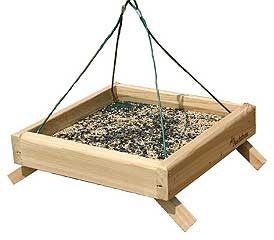 Holds over 12 pounds (1 1/2 gallons) of seed. Front seed level indicator window. 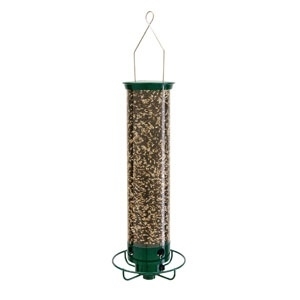 The best feeder for close-to-home bird viewing. Single-sided feeding for placement near windows or walls. Can be pole or post mounted. Hanger and pole included. Seed saver baffle reduces wasted seed. 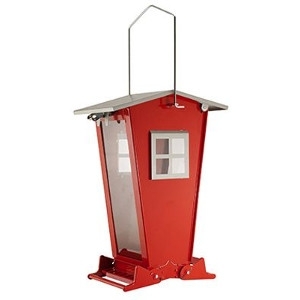 Spring operated perch drops and shuts off access to feed. Polycarbonate tube with a feeder base and dome that is coated with heavy-duty powder for long-lasting finish. 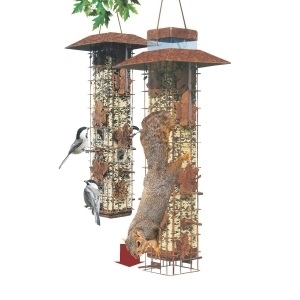 Feeder base and dome are specifically designed to baffle squirrels and protect your backyard birds. Base is attached with a spring to activate the shield and prevent squirrels from reaching seed ports. 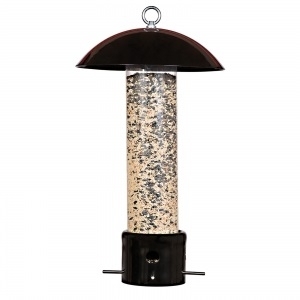 Attract a variety of birds and completely block out Squirrels from feeding on your feathered friends' food! Holds 4.2lbs of seed. Beautiful elliptical design with decorative satin nickel finish and locking metal roof. 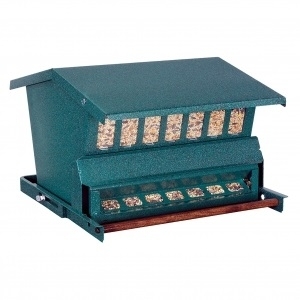 Integrated moving cage closes all four feeding ports with pressure from squirrels on the roof. Squirrels cant get the seed Feed Birds, Not Squirrels! 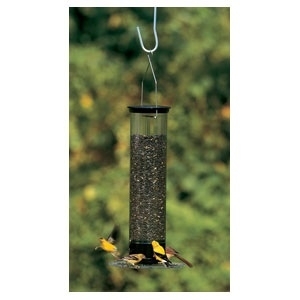 Wide-mouth design offers a feeder that is easy to fill and clean. Patented Stay Full Ports feature allocates seed evenly to all four ports. No more empty ports. Unique adjustable depth perches allow you to choose your birds. Feed the birds, Not the Squirrels!